COPENHAGEN, Denmark, August 15, 2015 (ENS) – Four Sea Shepherd volunteers, arrested for protesting the slaughter of hundreds of pilot whales, were deported from the Faroe Islands before dawn on Friday morning. Sea Shepherd Land Team Leader Rosie Kunneke of South Africa and volunteers Christophe Bondue of Belgium, Marianna Baldo of Italy and Kevin Schiltz of Luxembourg were escorted by plainclothes police officers onto a ferry at Tórshavn, bound for Hirchalls, Denmark. An autonomous country within the Danish kingdom, the Faroe Islands are an archipelago between the Norwegian Sea and the North Atlantic Ocean, halfway between Norway and Iceland. On August 8, the four Sea Shepherd volunteers were found guilty of breaking the Faroe Islands’ Pilot Whaling Act and public disturbance for interfering in the July 23 slaughter of more than 250 pilot whales on the beaches of Bøur and Tórshavn. Each of the volunteers was sentenced to either pay a fine of between 5,000 Danish krones (US$740) and 35,0000 krones (US$5,000), or serve jail time of between eight and 14 days. The prosecution also asked that the Sea Shepherd protestors be deported from the Faroe Islands. Appeals to the sentences and deportations were lodged at once by the defense. On August 11, the volunteers visited Tórshavn police station, to inform authorities that they chose jail time over deportation. Police said the final decision would be made by Danish immigration officials and asked that the request to serve jail time be submitted in writing. On Thursday, the four were notified that the appeal against their deportation was denied, and they would be deported from the Faroe Islands on Friday. So far this year, 12 Sea Shepherd volunteers, representing the United Kingdom, Italy, Corsica/France, the Netherlands, Belgium, Germany, Luxembourg and the United States, have been arrested in the Faroe Islands. All those arrested are accused of interfering in the drive hunt of pilot whales and other small cetaceans, known as the grindadráp. 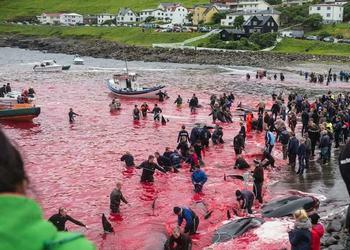 The grindadráp is the largest single slaughter of marine mammals in Europe. Since June, a total of 490 pilot whales have been killed in five grindadráps. Bloody images and footage of the slaughter as well as the arrests of five Sea Shepherd crew on July 23 and two other crew on July 20, for whom sentencing is pending, have sparked worldwide calls for Denmark to halt its support of the bloodshed. But the killing continues. On August 12, another five Sea Shepherd volunteers were arrested for attempting to interfere in a grind, where 61 pilot whales died on the beach in Sandvagur. 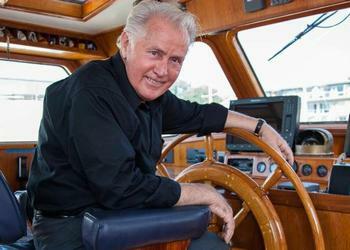 Award-winning American actor Martin Sheen sent a letter August 13 to Danish Prime Minister Lars Løkke Rasmussen, calling for an end to Denmark’s support of the pilot whale slaughter. “I am surprised that a nation that has such a wonderful record of positive social and environmental policies would support an annual massacre of whales for which there is no subsistence need,” wrote Sheen. “Toxic meat, unknown numbers, inhumane slaughter, no necessity. The Grind simply does not make any logical sense,” he wrote. “I was appalled to see the Danish Navy being used to defend the killing of hundreds of defenseless pilot whales,” wrote Sheen. “Does it really take a frigate, a patrol boat, commando units and a helicopter along with Danish police officers and a Faroese patrol boat to stop a group of compassionate, non-violent people?” he wrote regarding the Sea Shepherd protesters. “Is the need to slaughter so many animals really so important to Denmark? The meat from these whales is contaminated with mercury. If it were pork or beef so highly contaminated with mercury, it would not be allowed to be sold, yet even children are eating this toxic meat. And to make things even more disgusting, I have seen children mutilating the carcasses of the whales right after the slaughter,” Sheen told the prime minister. Sea Shepherd has evidence of large amounts of meat being dumped at sea, and Sheen speculates that the whale killing might be related to oil development. “The exploration for oil in the waters around the Faroes could be one reason that Denmark is willing to tolerate this atrocity,” he wrote. “Recently Denmark passed laws against kosher and halal methods of slaughter, citing cruelty to animals, and yet at the same time tolerating the cruelty in the Faroes. This smacks of discrimination based on an ethnic and cultural bias,” Sheen pointed out in his letter. Sheen is a longtime supporter of Sea Shepherd Conservation Society and friend of the organization’s founder, Captain Paul Watson. In 1995, Sheen joined Watson in the Gulf of St. Lawrence to oppose the Canadian seal hunt. Sea Shepherd Conservation Society’s research sailing vessel R/V Martin Sheen, unveiled in late 2014, is named in the actor’s honor. The vessel is currently in Costa Rica for an ocean research and awareness campaign.